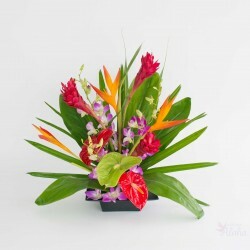 Categories: Hawaiian Flowers, Hawaiian Tropical Flower Assortments. 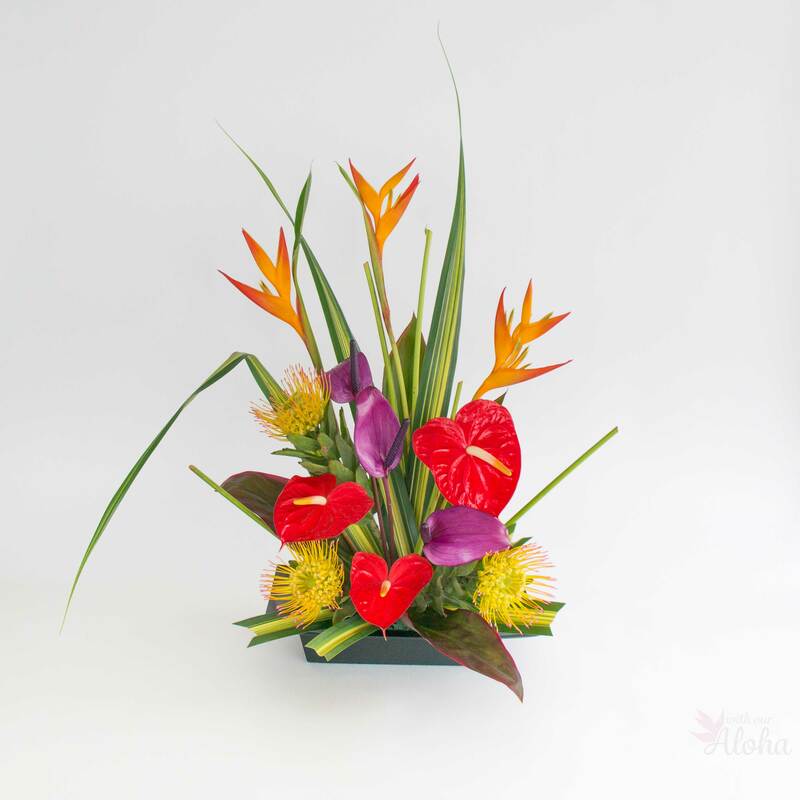 With beautiful heliconia, we made this one of our our featured Hawaiian flower assortments. 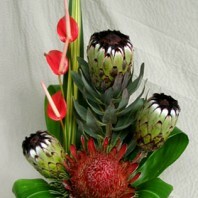 The purple arc tulip anthuriums set off the golden colors in the pin cushion proteas. 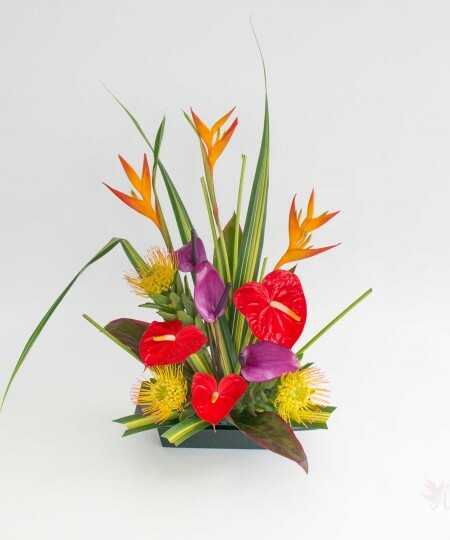 And the red anthuriums compliment the foliage for a stunning array of colors and textures. The pincushions and short and wide. 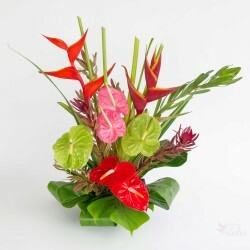 The heliconia are a tall flower. 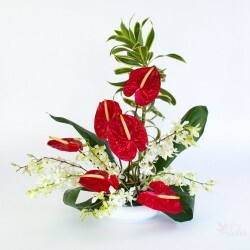 The red anthurium, like all of the stems in this assortment are sent as full length stems for you to size and arrange as you like. 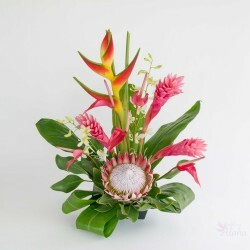 In old Hawaii the keiki (children) were primarily raised by the kupuna (elders). This is because everyone able had to work. 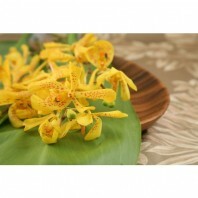 On occasions a young learner would stand out and become the punahele, the favorite. 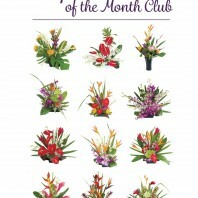 This is one of our more popular flower assortments. 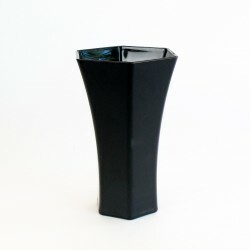 A true ‘Favorite’ and one of our top selling selections. 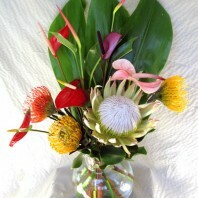 Pincushion protea are imported from Maui. 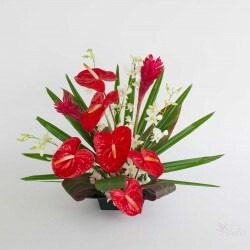 If they are not available when you order we will substitute a comparable flower. Yellow shampoo ginger works well if we can’t get the pins. 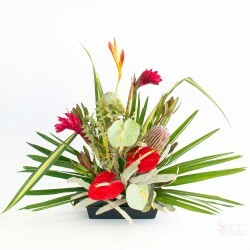 Arrives boxed as full stems to be arranged as you please.